David Cameron awoke with a start, and discovered that he had been shouting. “What is it darling?” said a wearily concerned Samantha. A bleary gathering at CCHQ was happening. It had not been a good week. Tony Blair stole the headlines on Tuesday, Labour’s policy on Non-Doms left the Tories on the wrong side of public perception, and Michael Fallon decided that the best way to discuss defence policy was as a gossipy fishwife. Furthermore, polls were emerging that morning that not only had Labour ahead, but also Ed Miliband ahead on personal ratings for the first time ever. The demand was for positivity, and the Prime Minister had some. 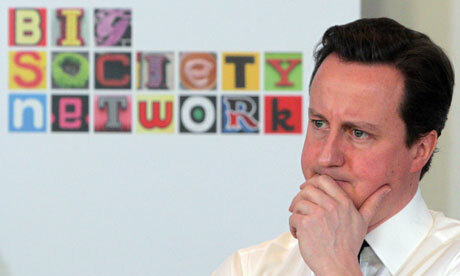 “We’re going to bring back the Big Society,” said Dave. No-one said anything, but looked at each other as if the PM had suggested getting back in touch with an ex-girlfriend who none of them liked. “We’re not going to call it that though, are we?” said Lynton Crosby, Stills, Nash and Young. “Oh, Lynton – the smiles of elders and babes in the face of generosity is reward enough for anyone. “Dave, are you alright?” enquired George Osborne, whilst Jeremy Hunt chimed in. Everyone stared in shock, smiled and nodded at him. He promptly left, humming “Pure Imagination” from Willy Wonka and the Chocolate Factory. The others just threw disbelieving glances at each other. The Tories are sent far and wide to get the word out. Eric Pickles was on The Today Programme and has an unfortunate slip of the tongue. When asked whether or not he would welcome the Tory campaign now being “relentlessly positive”, he stumbles and it almost sounds like he’s saying that the Tories are now being “resentfully positive”. Ed Miliband is in Edinburgh today, where he is spending a lot of his speech bashing the Conservatives, which is a bit like going into York and bad-mouthing Lancashire: you’re onto a winner. However, having scolding the Tories for their negativity and scaremongering, he suggests that the SNP are a secret austerity party, before he and Jim Murphy sing “Anything you can do I can better”. See, perspective. And of course, famously, emissaries from the Telegraph will arrive with howling dogs, armed to the teeth, and dressed in the uniforms of the NKVD. The Tories appear to be holding Congregational Practice to ensure all of their candidates rehearse their slogans thoughtlessly and at every opportunity. Today it’s Grant Shapps’ turn to parrot. He is facing a joke candidate in his constituency, called Michael Green, which was famously Grant Shapps’ non-de-plume for his second job. Grant says this little bit of light-ribbing is in fact a "demonstration of Labour chaos". Presumably, he also thinks that the sheer number of candidates who have put up deposits in his constituency is a sign that the long-term economic plan is working. David steals a moment and goes and gets some honest advice from his old mentor, Michael Howard. Michael, who was hanging upside down in his wardrobe deciding which cape to wear, decided to be frank. Michael looked at him, affronted. The Election Diary will return on Sunday.